Born in Devon in 1960, Drew Wilson studied English Literature at Cambridge, but returned to college in 1995 to pursue Music at Goldsmiths (Masters in Composition under Sadie Harrison and Roger Redgate) then moved on to the Royal College of Music where his teachers were Timothy Salter, Edwin Roxburgh and David Sawer, and where he also benefited from the wit and wisdom of such luminaries as Julian Anderson, Richard Causton and Ken Hesketh. Whilst at the College, he was awarded the Cobbett and Hurlstone Prize by Richard Rodney Bennet and was the first to be awarded the Doctorate of Composition. He has also worked as an artist and writer (he is currently finishing a novel about a composer - similar in dimensions, but in little else, to Mann's Doktor Faustus). His music has been played by the New Perspectives Ensemble and Andrew Ball (RCM), by members of the London Sinfonietta, by the Composers’ Ensemble, Psappha and Lontano at the Hoxton, Cheltenham and ‘La Linea’ (South Bank) Festivals, by violinists Matthew Jones, Ken Aiso and Thomas Gould, pianist Danny Driver and by the London Schubert Players with whom he recently toured to Romania and Paris on the 'Invitation to Composers' project. He is presently writing a violin concerto, or possibly concerto grosso, for Thomas Gould. The live recordings of 'Nocturne with Cloudscape' and 'Concerto for 12 - Plus Fort que le Destin' (in better sound quality) will shortly be released on Nimbus Records. Please look at the Music (Classical) page where I have just added the recording of Nacht und Nebel from Tintea-Baicoi-Prahova, on 20th July, played on two 2 accordions by the wonderful Marija Kandic and Terhi Sjöblom. To read the article I wrote about the performance of Nacht und Nebel at Tintea for the Romanian music journal No 14 Plus Minus, please click on 'More Stuff' to the left. Back row left to right: composers Sorin Lerescu, me, Stefano Bonilauri, Adina Dumitrescu, musicologist Adalbert Grote. 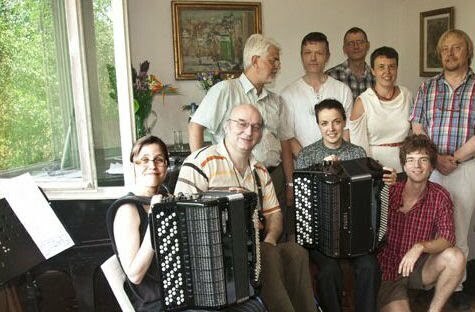 Front row; Terhi Sjöblom and Marija Kandic with accordions, George Balint and Sebastian Dumitrescu, composers. 'Nacht und Nebel' is now published by in a revised performing edition by Avantus - see HTML below.